"We had the sky up there, all covered with stars, and we used to lay on our backs and look up at them and wonder about whether they was made, or only just happened." -- Mark Twain, The Adventures of Huckleberry Finn. 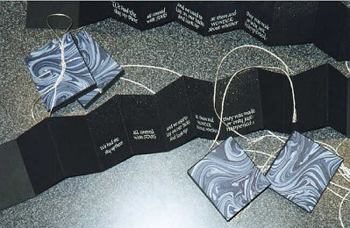 White acrylic ink on black text paper, marbled covers; non-adhesive binding.